Stress incontinence treatment without the stress! If you suffer from stress incontinence you’ll know what a massive effect it can have on day-to-day life. The worry of potential leaks is stressful and can stop you from carrying on with normal activities like exercise. Treatments like pads and diapers are often bulky and uncomfortable, leaving you feeling self-conscious. Many women choose to use a pessary to treat their incontinence, but the wide variety of models on the market can be confusing and intimidating to use. 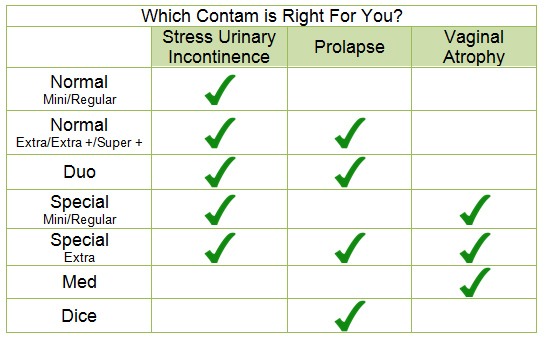 The Contam stress incontinence pessary is so much simpler – it’s very similar to a standard menstrual tampon, making it quick and easy to insert and remove. Contam Duo is a specially designed double pessary for stress incontinence. The Contam Duo is designed to offer a stronger level of protection than the Contam Normal; its double shape has a wider fit with a slightly shorter length. It raises the vaginal wall, shutting the urethra enough to prevent involuntary loss of urine. You will still be able to urinate normally but can go about your day without worrying about leaks, all completely discreetly; no more dressing to conceal bulky pads! Wearing a Contam pessary is excellent for your pelvic floor as your muscles will work to hold it in place all day, getting stronger in the process. Treating stress incontinence, prolapse and weak pelvic floor muscles.